During the light-hearted episodes, things are generally okay. There’s plenty of the same chemistry between the characters and it’s always neat to see how Rikka and Dekomori will turn ordinary things into something fantastical. The episodes that focus on Dekomori and Nibutani are actually some of the series’ strongest and, thankfully, they receive a lot more focus than they did in the first season. That said, the comedy is definitely weaker than the first season. Some of the jokes fall completely flat and then there are episodes that involve such things as Kumin’s ‘napping contest’, which by itself is kind of iffy. The largest problem with Ren is that it lacks any sort of pacing. It changes from silly chuunibyou nonsense to sappy melodrama without warning. How is anyone supposed to care about the drama when no time is given to first prepare it? It’s like the story started in media res, a few random chapters taken out of a larger novel. A new girl shows up, falls in love with Yuuta, causes some trouble, and then, bam, it ends on the same footing as the first season. No resolution; nothing added to the characters. And why is Shichimiya here in the first place, anyway? Her contrived introduction is already enough to get the eyes rolling. She joins the crew in the chuunibyou nonsense, which is fine, but then she is immediately given the spotlight in order to cause melodrama where there never needed to be any. It’s essentially just a copy and paste of Rikka’s growing feelings for Yuuta at the end of the first season. Heck, KyoAni is so lacking in ideas that they even threw in the ‘Yuuta reading a note from his past self’ again. The characters are not mature enough to support the drama. 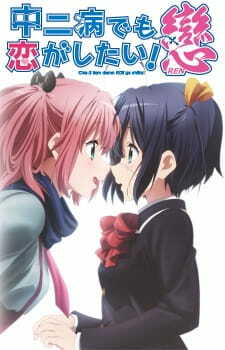 It’s difficult to care much about Yuuta’s and Rikka’s relationship when they go about it like child’s play. The season desperately, desperately needed more Nibutani as they are the only two in the show who feel even remotely human. Even if KyoAni decided to go full-force with the drama, there’s a good chance it could have worked with Nibutani. Instead she is relegated to the background during the important scenes, a sort of cheerleader, a pal who pushes the two forward because they are too childish to take that step themselves. At least there is little to complain about when it comes to the visuals. It’s the usual quality you would expect of KyoAni, with plenty of motion blur and pretty scenery for you to awe at. The music is also great. Most of the background tracks are so quiet that you wouldn’t ordinary notice them, but they do a solid job in enhancing the mood of each scene. On the other hand, the opening sequence is catchy but noticeably less interesting than the first season. Many people complained about all the fast cuts in the first season’s opening, but hey, it was unique. It gave the show that extra bit of charm. The opening and ending sequences here don’t really achieve that. They just exist.